Ever since my office moved next to Trader Joe's it has become a ritual for me to stop on Friday afternoon for weekend supplies. It's so funny to me that for a relatively tiny store there are so many amazing and unique things to try. I also think it's very cool that all of these things are their proprietary brand. I always feel a little like I stepped back in time and am at the corner store owned by some little Mom & Pop. I have only scratched the surface of all the wonderful stuff they have and every week I try to grab some new thing but today let's talk favorites. These are the things I reach for just about every time I go because either I or everyone else (usually both) in my house love them. BAGS - If you read me you know I am a bag whore. I love their shopping bags. They are always bright and cheerful and they hold up very well. I never need an excuse to grab a new design when it comes out. CREAMY TOSCANO CHEESE - Since I am also a cheese whore... this. Several area grocery stores sell a similar but more expensive version of the exact same cheese. The TJ's wedge is twice the size and half the price. Get in my face with a nice glass of wine pronto. 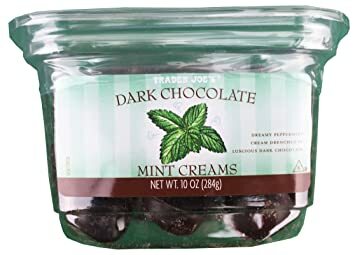 DARK CHOCOLATE MINT CREAMS - I looooove York Peppermint Patties. These are a tiny bite size drop of heaven that is basically the same only a little softer and meltier, that's totally a word. Be warned if you are a mint lover... addictive. GORGONZOLA GNOCCHI - I kind of wish I had never tried these little pillows of cheesy potato goodness but alas I have and they are now in my dreams. Bonus, super fast and easy meal for one, even though the bag says otherwise. SPATCHCOCKED LEMON ROSEMARY CHICKEN - I saw this in one of their ads and they raved about it so I tried it. You guys, if you don't feel like spatchcocking your own damn chicken just get one of these. It's a whole chicken split up the back and you roast it flat in a pan so it cooks faster. Absolutely delicious. Make a salad or a veg and you are done! 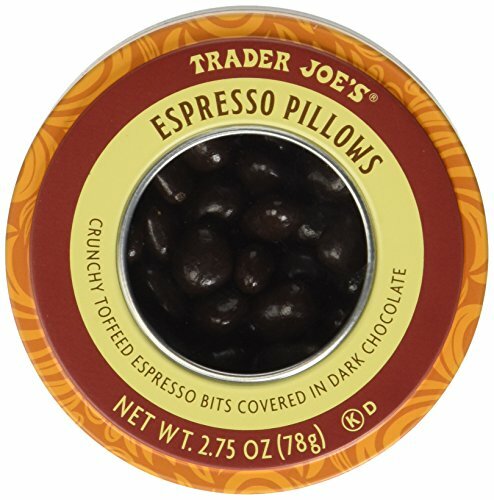 ESPRESSO PILLOWS - If you are standing in the checkout trying to decide which delicious little grab and go treat you want, get these. If you are a coffee lover you will not be sorry. I am sorry but you are going to have a hard time not finishing the whole tin. They make a great little gift item if you need something extra too. 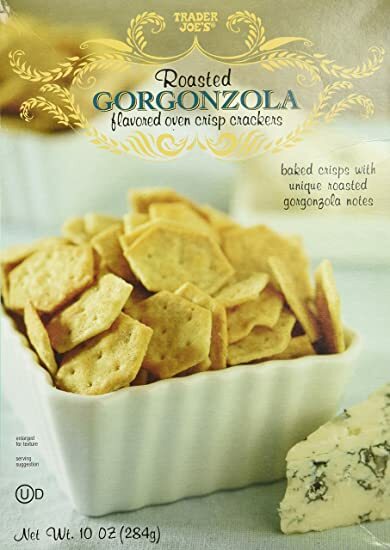 ROASTED GORGONZOLA CRISPS - Clearly I have a cheese problem and I admit it freely. These are kind of like a more gourmet version of cheeze-its. They are bite size so don't really plan on serving them with cheese just more or less tossing a handful into your mouth. You're welcome. 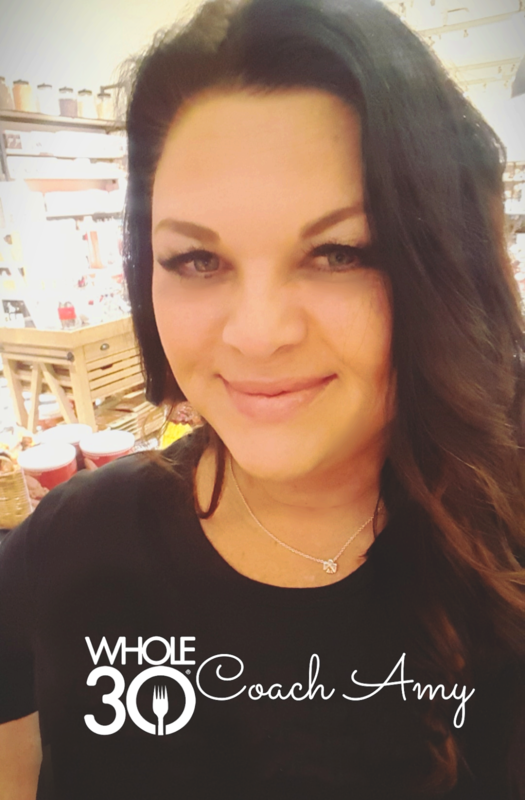 Three of my most favorite things (the cheese and the gorgonzola crackers and gnocchi) are on your list! I need to try those chocolate mint things. YUM!!!! The sweet potato butter sage gnocchi isn't too bad. I pick it up when they are out of the gorgonzola. Chris loves the Chicken Lime burgers in the frozen section, we always have some on hand. And we stock up on meats (salami types) because they are so well priced there. Their K cups are $5 a box if you have a Keurig. I still have my Atlanta bag. I used to live right down the street from one when I lived there and now the only one in Birmingham is 40 minutes away from my house. So rude. That syrah cheese is literally everything. I eat it CON-STANT-LY. Soo good! I'm going to have to try the chicken based on the name alone and the mint things because I freaking love mint. I like going to TJ's but it's too far of a walk with bags from my office and the parking lot situation is terrible at the one closer to my house. When I do make a trip I'll put those on my list.